MOSCOW (AP) At its first World Cup in 20 years, Morocco has a horrible set of results to show for efforts on and off the field. FIFA’s public condemnation Thursday of Morocco winger Noureddine Amrabat for questioning the integrity of an American referee added to a sense of national injustice over a tough nine days in Russia. Neither will Morocco host the 2026 World Cup. Impressive late lobbying in Moscow last week failed to overcome the United States-Canada-Mexico bid that was clearly favored by FIFA leadership. Football’s world governing body has continued to be tough on Morocco since its member federations voted to give the North Americans a clear win on the eve of the tournament. Morocco was also criticized this week by FIFA for ”questionable handling” of a suspected concussion case – again involving Amrabat. The World Cup experience has left a proud North African nation little to cheer. ”There is one thing I am sure of is that the whole Moroccan people are very proud of its team,” coach Herve Renard said Wednesday after losing to Portugal. Many of around 25,000 Morocco fans at Luzhniki Stadium, and more back home, vented about what they saw as unfair refereeing decisions. The coach’s angry response to one challenge led to a lecture from referee Mark Geiger for demanding video review to award a penalty. That incident also centered on Amrabat, whose claim in a post-game television interview infuriated FIFA. The Morocco player said he was told by Pepe that Geiger asked to get the Portugal defender shirt’s after the game. Days earlier, FIFA noted the ”questionable handling” by Morocco staff of Amrabat’s head injury against Iran after taking a crashing face-first fall to the turf. It happened late in a game Iran would win deep in stoppage-time when Morocco forward Aziz Bouhaddouz headed the ball into his own net. Medical staff trying to get Amrabat back in the action slapped his cheeks while lifting him to his feet like a groggy boxer. ”FIFA will address this matter with the Moroccan (soccer federation),” FIFA said Thursday about Morocco’s decision to select Amrabat again just five days later. Defying widespread concerns, Renard described Amrabat as a ”warrior,” and the player suggested he was best placed to judge his fitness. The Morocco federation didn’t immediately respond to a request for comment Thursday. Morocco’s final Group B game is Monday against Spain, its near-neighbor in Europe who could be part of a shared World Cup future. Within hours of the 2026 vote defeat, Moroccan King Mohammed VI ordered a renewed campaign to secure the 2030 tournament. 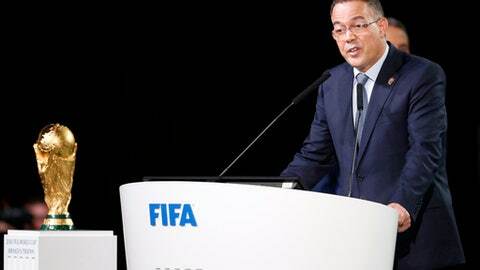 There is a speculation of teaming with Spain and Portugal in a three-nation bid that, while making geographical sense, would need FIFA to allow hosting across continents. After five failed bids since the 1980s, nothing seems to come easy for Morocco in the World Cup.